Citing it as the progressive, post-1945 movement that encompassed the creation of the NHS, public libraries and free education – “a belief in equality” – Montgomery’s passion for the Modernist idea is audible. Galvanised by the spiralling cost of tuition fees, Tory cuts, a certain Trump and the rise of anti-ecological ideology, there’s never been a better time for him to challenge the depletion of such freedoms. 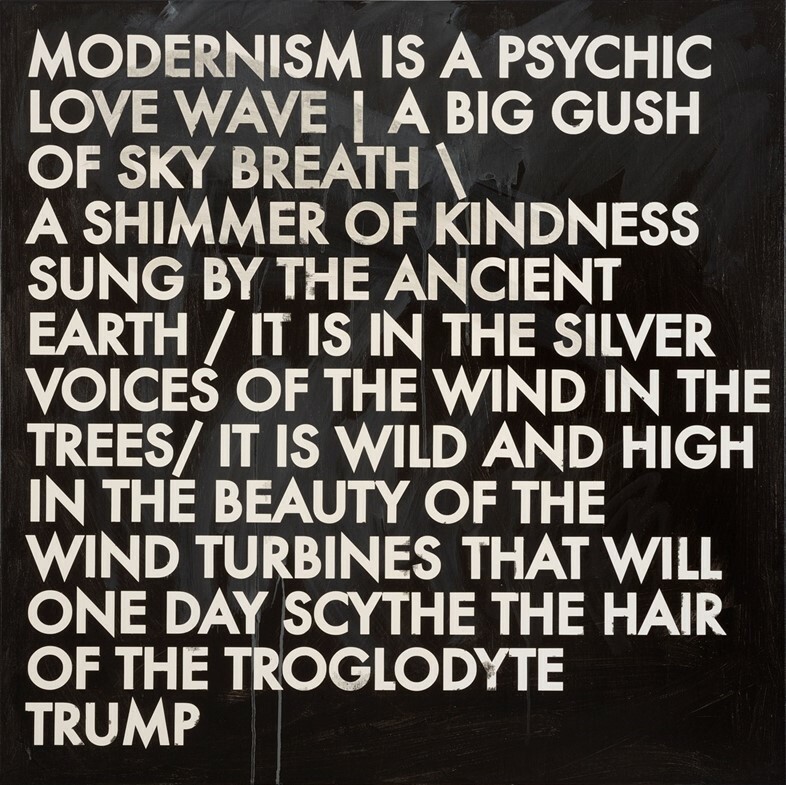 Combining socio-political declaration with his unique, trademark brand of mysticism (“Modernism is a psychic love wave / a big gush of sky breath / a shimmer of kindness sung by the ancient earth”), the works featured in Hammersmith Poem and Love Letters to Kazmir Malevich blend poetry and painting in their confrontation of the now. For Montgomery, it’s about restating the benefits of a brave and optimistic social responsibility. “We’ve lost idealism – what I'm trying to do with the work in the show is reignite that idealism. 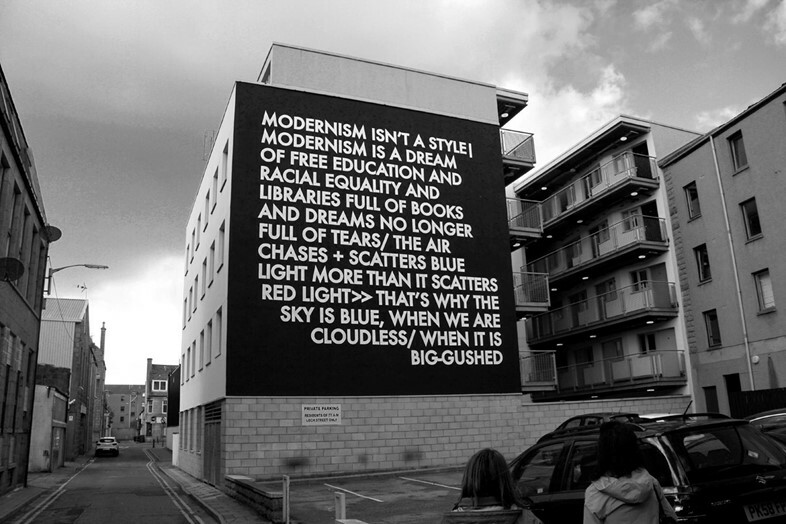 A belief in free education, free healthcare, gender equality, race equality – all of these things that, for me, are modernism, are ideals. We have to find ways to reignite those ideals and make them passionate, beautiful, full of ecstatic joy and peace. 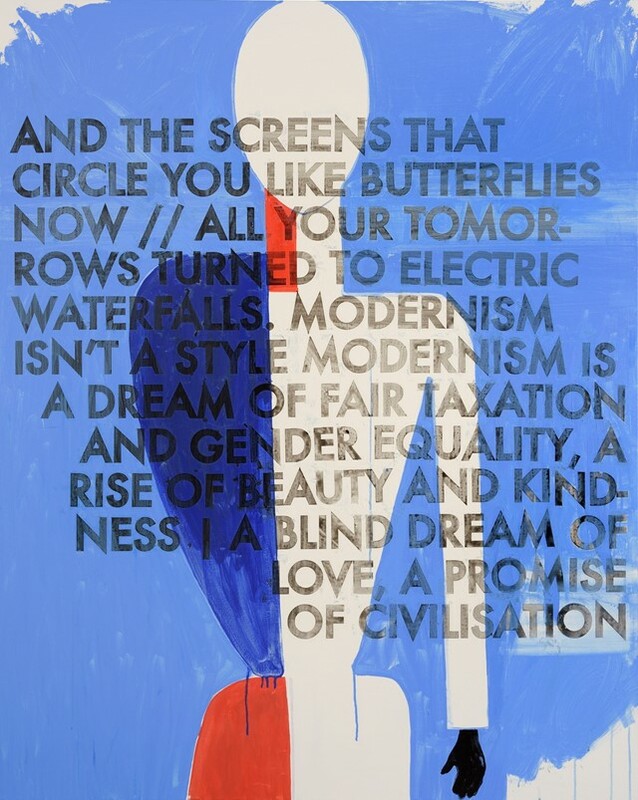 While March’s Hammersmith Poem alluded to the work of Malevich with its adoption of the famous ‘black squares’, the October exhibition embraces it directly, encompassing composition structures of the Russian artist’s works. For Montgomery, following the Cob commission, it made sense to further explore the link – plus, it gave him an excuse to return to painting, a discipline he felt he’d been neglecting (“I studied painting and I realised, now, it’s the only thing I don’t do – I forgot why I stopped!”). Though there’s an urgency to the declarations of the art, it shouldn’t be confused for pessimism. Referring to the mobilising phenomenon of the Corbyn Momentum movement as one of the most encouraging things he’s seen in “his lifetime”, Montgomery is bullishly positive about the future of a politics built upon kindness, empathy and hope. He sees a platform for the re-adoption of Modernism in Britain – and he’s right at the forefront of those arguing in its favour. As for America? He’s similarly upbeat. “I feel optimistic that Trumpism is not the beginning of an alt-right. I don’t believe it’s the beginning of a new right. I believe that Trumpism is the end, a dying breath of an ideology that’s already proved itself to have failed. I see it as a last gasp of a failed and fading ideology.